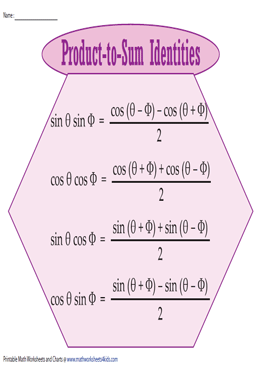 The product-to-sum and sum-to-product identities in trigonometry are derived from the sum and difference identities. 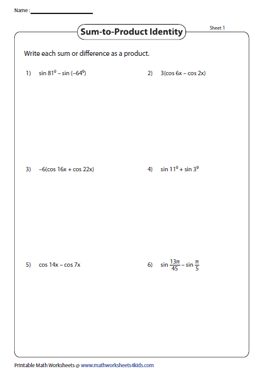 These identities assist in converting a trig expression presented as a product to a sum or vice versa, evaluate and verify trig expressions using the sum to product and product to sum formulas. 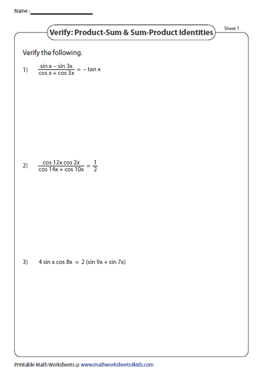 Instantly validate your solutions given in the comprehensive answer keys. These product-to-sum and sum-to-product formula charts play a pivotal role in learning the identities. Employ them to equip yourself with a thorough knowledge of the identities before attempting the exercises. 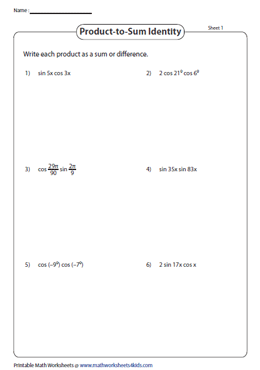 Tackle this set of trigonometric expressions by transforming the product of sine and cosine into a sum or difference using the product to sum identity. Express the product in the trigonometric expressions as a sum. An alternate form of the product to sum identity, is the sum to product identity. 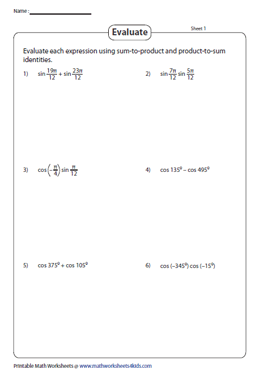 Convert the trig expression involving a sum or difference of sine and cosine trig functions into their products in this set of worksheets. Observe the identity, if the trig expression is given as a product, then use the product to sum formula to evaluate and if the expression involves a sum or difference, then employ the sum to product formula. Pick a side to begin with, manipulate it until it is transformed to the other side using a combination of all trigonometric identities in general and product-sum formulas in particular.